GREAT LOCATION! BEAUTIFULLY UPDATED AND MOVE IN READY! Highly Desirable With a Large Number of Nice Sized Rooms with a Great Layout. THE KITCHEN AND BATH ARE WITH ALL NEW WOOD CABINETS, GRANITE COUNTER TOPS, NEW LIGHT FIXTURES, AND ALL NEW HIGH END STAINLESS STEEL APPLIANCES. This Beautiful 4 Bedroom, 1.5 Bath Home Is Light And Bright With Lots Of Natural Light. There is an Abundance of Living Space...Very Roomy with 1473 Heated Square Feet and is with a 3 Way Split Bedroom Plan. There is a Nice Sized Living Room and Dining Room and the Kitchen is with a Breakfast Nook Which Opens to the Large 15x11 Florida Room/Sun Room. Freshly Painted Interior. All Tile and Wood Flooring For Easy Maintenance. Plenty Of Closet Space, The Garage Has Been Converted Into a Large Master Bedroom With a Half Bath and a Step-In Shower. Could Easily be Converted Back to a Garage if Desired. Newly Updated Fenced In Yard Provides Privacy and Great For Pets! NEW ROOF with 30 Year Transferrable Warranty, AC (2015) Water Heater (2016), Newer Electrical Panel. Enjoy Your Local Forest Hills Country Club Bar and Grill with Great Food and a 9 Hole Golf Course with Great Rates! Minutes To Pinellas County, Close To Shopping, Restaurants, Entertainment, The World Famous Tarpon Springs Sponge Docks, Parks, Tarpon Springs Beaches, Antique District, Medical/Hospital. There Is No HOA, No Deed Restrictions, And Low Taxes. With So Much To Offer This Will Not Last Long! Don't Wait! 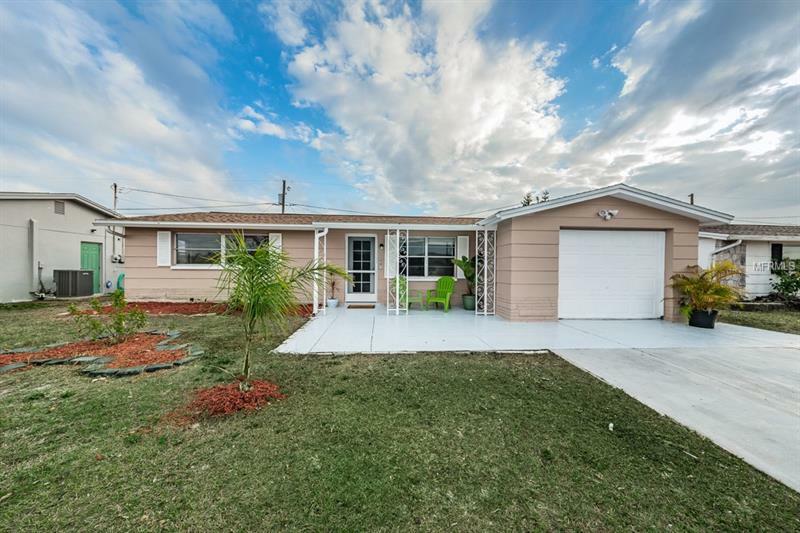 You're Going to Love Your New Florida Home!